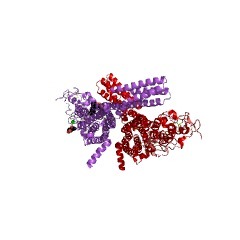 Frizzled is a family of G protein-coupled receptor proteins (PMID: 14977528) that serves as receptors in the Wnt signaling pathway and other signaling pathways. When activated, Frizzled leads to activation of Dishevelled in the cytosol. This domain is the membrane spanning region of frizzled and smoothened receptors. This membrane region is predicted to contain seven transmembrane alpha helices. Proteins related to Drosophila frizzled (P18537) are receptors for Wnt (mediating the beta-catenin signalling pathway) [(PUBMED:8717036)], but also the planar cell polarity (PCP) pathway and the Wnt/calcium pathway. 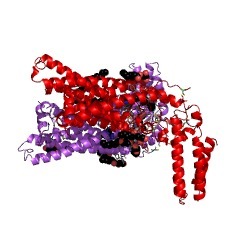 The predominantly alpha-helical Cys-rich ligand-binding region (CRD) of Frizzled is both necessary and sufficient for Wnt binding [(PUBMED:15239825)]. 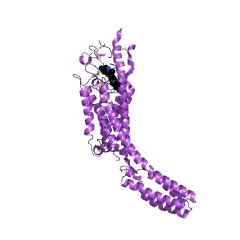 The smoothened receptor mediates hedgehog signalling [(PUBMED:9811578)]. There are 5099 Frizzled domains in 5097 proteins in SMART's nrdb database. Taxonomic distribution of proteins containing Frizzled domain. This tree includes only several representative species. The complete taxonomic breakdown of all proteins with Frizzled domain is also avaliable. Click on the protein counts, or double click on taxonomic names to display all proteins containing Frizzled domain in the selected taxonomic class. Frizzled genes encode integral membrane proteins that function in multiple signaltransduction pathways. They have been identified in diverse animals, from spongesto humans. The family is defined by conserved structural features, includingseven hydrophobic domains and a cysteine-rich ligand-binding domain. 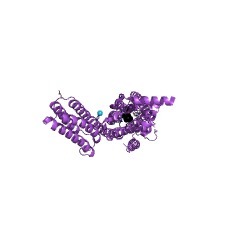 Frizzledproteins are receptors for secreted Wnt proteins, as well as other ligands, andalso play a critical role in the regulation of cell polarity. Frizzled genes are essential for embryonic development, tissue and cell polarity, formation ofneural synapses, and the regulation of proliferation, and many other processes indeveloping and adult organisms; mutations in human frizzled-4 have been linked tofamilial exudative vitreoretinopathy. It is not yet clear how Frizzleds couple todownstream effectors, and this is a focus of intense study. In vivo evidence that Patched and Smoothened constitute distinct binding andtransducing components of a Hedgehog receptor complex. During Drosophila development, cells belonging to the posterior compartment ofeach segment organize growth and patterning by secreting Hedgehog (Hh), a proteinwhich induces a thin strip of adjacent cells in the anterior compartment toexpress the morphogens Decapentaplegic (Dpp) and Wingless (Wg). 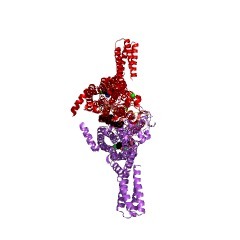 Hedgehog is boundand transduced by a receptor complex that includes Smoothened (Smo), a member of the Frizzled (Fz) family of seven-pass transmembrane receptors, as well as themultiple-pass transmembrane protein Patched (Ptc). Ptc is required for thebinding of Hh to the complex as well as for the Hh-dependent activation of Smowithin the complex. Here, we identify a likely null allele of the smo gene anduse it to determine whether Hh is bound by Ptc alone, or by Smo in concert withPtc. We find that cells devoid of Smo can sequester Hh, but that their ability todo so depends, as in wild-type cells, on the expression of high levels of Ptcprotein. These results suggest that Ptc normally binds Hh without any help fromSmo and hence favor a mechanism of signal transduction in which Hh bindsspecifically to Ptc and induces a conformational change leading to the release oflatent Smo activity. A new member of the frizzled family from Drosophila functions as a Winglessreceptor. 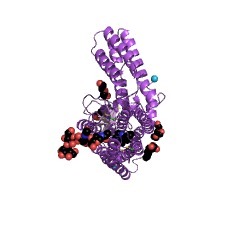 Receptors for Wingless and other signalling molecules of the Wnt gene family haveyet to be identified. We show here that cultured Drosophila cells transfectedwith a novel member of the frizzled gene family in Drosophila, Dfz2, respond toadded Wingless protein by elevating the level of the Armadillo protein. Moreover,Wingless binds to Drosophila or human cells expressing Dfz2. These datademonstrate that Dfz2 functions as a Wingless receptor, and they imply, ingeneral, that Frizzled proteins are receptors for the Wnt signalling molecules. 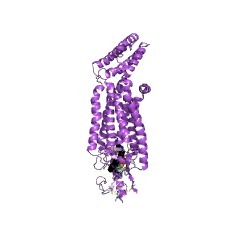 4n4w Structure of the human smoothened receptor in complex with SANT-1.